Whisk together chili paste, honey, lime juice, garlic, and oil. Toss dressing with turkey, carrots, peppers, edamame, and onions. To make each salad, place 1 c. romaine in a 16 oz. bowl or clear clam shell. 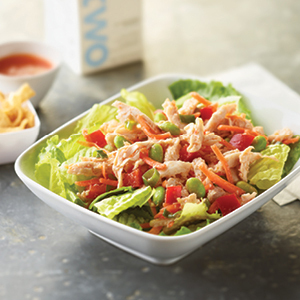 Top with a #6 scoop (²/³ c.) turkey salad. Sprinkle with ¼ c. crunchy noodles. Keep chilled at 41°F until service. MEASURE: 3 tbsp. 1 tsp. 1 serving provides 2 oz. meat/meat alternate, ½ serving bread/grain, and ¾ cup vegetable (½ c. dark green, ¼ c. other). Thai chili paste 1/4 c. 2 tbsp. 3/4 c.
Honey 1 1/4 c. 2 1/2 c.
Lime juice, fresh 1 1/4 c. 2 1/2 c.
Garlic, chopped 1 tbsp. 2 tsp. 3 tbsp. 1 tsp. Shedded carrots, RTU 2 1/2 c. 1 qt. 1 c.
Red bell peppers, diced, ¼", RTU 3/4 c. 1 1/2 c.
Edamame 3/4 c. 1 1/2 c.
Green onions, thinly sliced 10 ea. 20 ea. Crunchy chow mein noodles or crunchy wonton noodles 1 lb. 8 oz. 2 lbs. 15 oz.